A sectional sofa is typically large enough for several people to sit on at once. 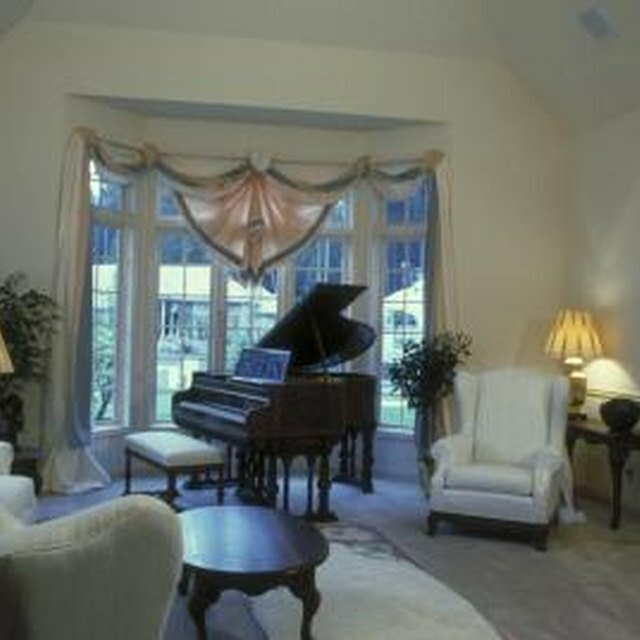 It is often L-shaped or even a modified U-shape, therefore it takes up the majority of space in the living room or den. Using the correct layout of this piece of furniture is vital to how comfortable the room is to you, your family and guests. Ensuring that the traffic flow is not blocked is also imperative for the layout to work efficiently. The sofa sectional layout is vital to the look of your living room area. Map out the layout you have in mind for the living area. Measure the room dimensions and the sizes of each piece of furniture. Draw them on a piece of graph paper according to the measurements. This plan enables you to move the furniture pieces around on the paper rather than lifting heavy furniture multiple times. Include windows, doors, architectural features and hallways on the paper. Start the layout by placing the sectional opposite the main feature in the room. This is often the TV, a bay window, piano or a fireplace. Setting the sectional opposite the focal point enables people to watch TV or view a crackling fire with ease. Position the sectional so that it doesn't block air or heating vents, doors, hallways or juts out into the walkway through the room. Add the remaining furniture to the layout so that all pieces angle toward the focal point. This forms a cozy conversation area. Allow at least 18 inches of space or more in the areas that people use to walk through the room. This prevents someone from bumping into furniture jutting in the pathway. Place a coffee table or attractive area [rug](https://society6com/rugs?utm_source=SFGHG&utm_medium=referral&utm_campaign=8775) in front of the sectional sofa. This adds balance and continuity to the large piece. Fill empty corners or areas that seem stark with silk or live potted plants. This adds color and texture to the bare spaces. Divide the sectional sofa up into smaller pieces, if it allows you to do that. This is an option if you want separate conversation areas in a long, narrow room or one that is L-shaped. Add a rug in front of the sectional piece, a small table, lamp and an occasional chair if there is space. This provides unity to the space. Overcrowding the layout tends to make the room look smaller, untidy and cramped. Consider using the sectional as the only large piece of furniture in a room if it is quite small. Add a floor lamp or a tall plant and an area rug to give a sense of intimacy to the layout. What Size Area Rug Over Hardwood Floors?